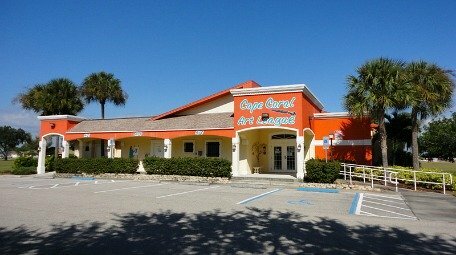 Cape Coral Art League is a terrific place to take art classes, show your work, and socialize with other artists. The Art League was established in 1965 as a non-profit organization to promote art throughout Southwest Florida, and has been in it's present location on Cultural Park Blvd since 1984. It's next door to Cultural Park Theatre and the Cape Coral Historical Museum. With 2 additions, one in 1991 and another one in 2002, there's plenty of room for workshops, classes, and shows. The League offers art classes for kids, teens, and adults year round whether members or not. Classrooms are spacious and bright with lots of natural lighting. Examples of classes are: watercolor, acrylics and oils, pastels, and photography. Check out their Dolphins Art Project, which features "Dancing Dolphins" sculptures painted by local artists that are located around town. Membership meetings run October - April and art show receptions are also monthly from October - May. The Art League has an Annual Art Sale and Festival. They also have an art show featuring local elementary schools. Volunteers, new members, and patrons are always welcome. Their office is open Monday - Thursday from 11AM-4PM during season from October - May. Call first for information during the summer. the office is closed and the league has limited hours from June - September.